Overseas based Guyanese, female sprinter Brenessa Thompson, finished second in the 200m event at the UTSA Roadrunner Invitational over the weekend as she continues her impressive form on the College Circuit. 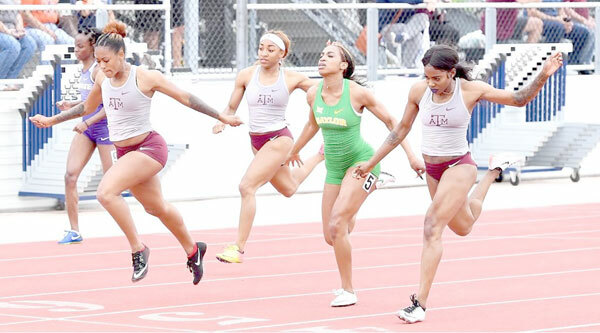 Brenessa Thompson (right) finished 2nd in the 200m Women final over the weekend behind her Texas A&M teammate Diamond Spaulding (second left). Thompson who is Guyana’s 200m record holder (22.99 seconds) followed up her impressive 100m win in the Arizona State Baldy Castillo Invitational with a 23.04 seconds run in last weekend’s 200m. Thompson whose best time in the 100m is 11.14 seconds which was set at the National Track and Field Facility (NT&FF) at Leonora in 2016, finished closely behind her teammate Diamond Spaulding who clocked 22.98 seconds and ahead of Amber Ivy (23.30 seconds). It was a good track meet for Thompson’s Texas A&M University that finished as the overall winners at the event. The student-athlete who represented the Golden Arrowhead at the Rio Olympic Games in 2016 continues to perform creditably as she aims to don Guyana’s colours at the 2020 games in Tokyo, Japan.